In Vedic terms, Pongal is referred to as the Vedic winter solstice. It is the period when the Sun God begins its journey northward as it transits into the constellation of Capricorn. It signals the end of darkness and the return of the Sun God with ever increasing daylight. This is considered to be the auspicious period to offer prayers and Poojas for receiving blessings from the glorious Sun God and to rewrite the rules for the coming year. Pongal, the harvest festival of India is celebrated to thank God for the good harvest produced during the year. On Pongal, people drive away all the bad memories of the past year by burning their old items and looking forward to a new beginning. Pongal is quite significant because of the transit in which Sun enters Capricorn in mid-January. This transit is a powerful opportunity to change your old ways and rewrite the rules for the next year. You will be amazed to know that even Indra, the king of heaven, rejoices during this time of abundance, fun, luxury and happiness. 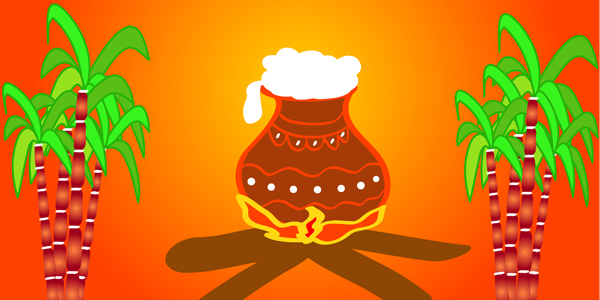 Bhogi Festival: it comes prior to the transit and is a time to clean your homes and your mind.. Spiritually this means an overhaul of your current self and getting ready for a higher self. Pongal: Sun Enters Capricorn and winter comes to an end. Pongal day is the day when the Sun enters the sign Capricorn. Winter comes to an end and there is a gradual onset of sunny days. When the Sun enters Capricorn, it marks the dawn of positive signs. The Puranas say that the gates of Heaven will be open for 6 months from then onwards. From this day onwards, Sun begins to move northwards which is the direction of Kubera, the god of wealth and material riches. People offer their prayers to the Sun God as a token of gratitude for his light and the energy he gives to all living beings.